The construction of the prototype Schwarzschild–Couder Medium-Sized Telescope (SC-MST or SCT) of the Cherenkov Telescope Array (CTA) project, in which Prof. Hiroyasu Tajima and Jr. Assoc. Prof. Akira Okumura of the Cosmic-ray Research Division, ISEE, are full members, has been completed and its inauguration ceremony was held at the Fred Lawrence Whipple Observatory, Arizona, US on Jan 17, 2019. SCT is designed to observe celestial gamma rays in the main energy coverage of 80 giga-electronvolts (GeV) to 5 tela-electronvolts (TeV), and are capable to observe from 80 GeV to 5 TeV. The Schwarzschild–Couder optics, which employs aspherical primary and secondary mirrors, was adopted in the SCT design to realize a primary-mirror diameter of 9.7 m, camera field-of-view of 7.6 deg, and pixel size of 4 arcmin. 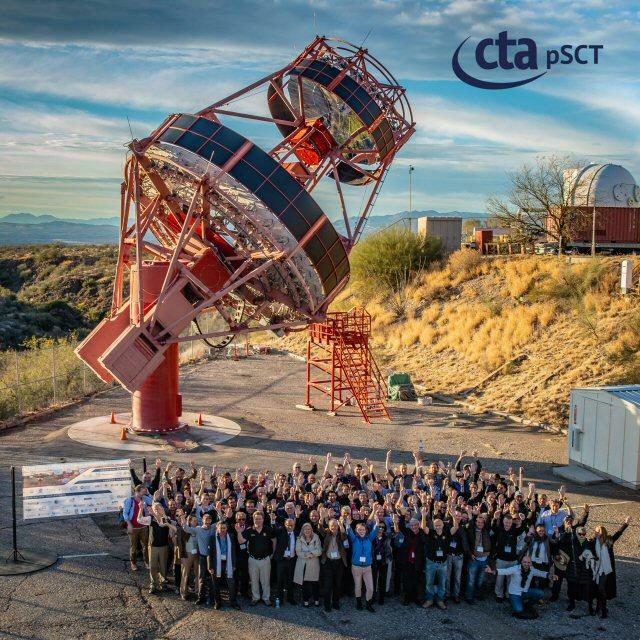 The ISEE CTA group has been actively working on the development of the focal plane camera and optical system of SCT. The technologies we developed are also used in the CTA small-sized telescopes.